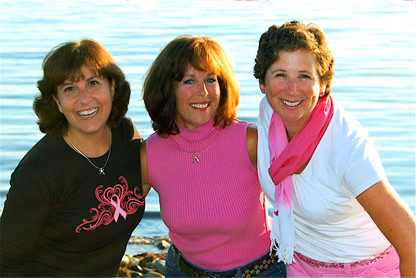 The writers of The MOMologues: Pink Ribbon Overdose, Lisa Rafferty, Jane McGovern and Pam Ahl, were honored for their philanthropic contribution to breast cancer outreach organizations as one of Massachusetts General Hospital's the one hundred. The one hundred is Mass General Cancer Center's annual fundraiser, honoring 100 individuals and groups whose diligence and discoveries, philanthropy and passion have helped advance the fight against cancer. Funds raised at the gala support research, patient care, education and community outreach programs. The 2011 honorees were celebrated at a gala on June 1, 2011, hosted by Academy Award winner Matt Damon. Event co-chairs included Teresa Heinz and Senator John Kerry, Patti and Jonathan Kraft, and Laura and Stephen Lang. The one hundred honorees are comprised of scientists, physicians, caregivers, patients, advocates, volunteers, philanthropists and others who have contributed to the fight against cancer in creative and meaningful ways. Past honorees include Elizabeth Edwards and, posthumously, Senator Edward Kennedy. "We are deeply honored to be recognized for our efforts to bring healing through shared laughter to other breast cancer survivors and their families," said Pam Ahl. Jane McGovern added, "It is incredibly gratifying to be honored alongside so many exceptional individuals and groups who are making a real difference in the lives of cancer patients." The playwrights share the honor with cast members, including Erica McDermott (The Fighter), Ellie Fund Executive Director Julie Nations, and WCVB-TV network newswomen Bianca de la Garza, Susan Wornick and Karen Holmes Ward. Lisa Rafferty stressed that, "The show would not be receiving this recognition without the talent, commitment and high profile of our amazing cast. This is an honor we all share." Boston-area audiences know the work of writer-director Lisa Rafferty through her comedies about motherhood: The MOMologues and MOMologues2: Off to School, written with fellow moms Sheila Eppolito and Stefanie Cloutier. When she was diagnosed with breast cancer in November 2007, Rafferty's friends and family frequently asked if she would write a comedy about the experience. She was happy to oblige once she found willing collaborators who had gone through treatment and knew that looking for laughs in unlikely places helped enormously. When Rafferty's friend Pam Ahl reached out to her in June 2008 to share her stories, the comedic collaboration was born. One year later, Jane McGovern, longtime friend to both women, was diagnosed with breast cancer and the team was complete. The creators hope the show helps with the healing of their fellow survivors, friends and loved ones. Rafferty, McGovern, Ahl, along with MOMologue Productions, are proud to present The MOMologues: Pink Ribbon Overdose, the latest member of The MOMologues family. 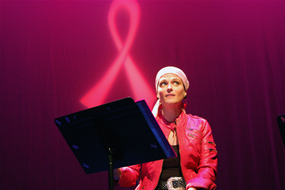 The hit show The MOMologues: Pink Ribbon Overdose returned with a star-studded cast to The Company Theatre in Norwell, MA on March 3, 2015 to benefit empowerHER, a non-profit organization that exists for young girls who have experienced the early loss of their mother. The sold-out show featured a cast of high profile Boston-area actresses who have all been touched by breast cancer. The hour-long, staged reading included performances by South Shore actress Erica McDermott (The Fighter, American Hustle, Black Mass), TV Host/Creator of Bianca Unanchored, Bianca de la Garza, Emmy-award winning arts and entertainment critic and cancer survivor, Joyce Kulhawik, as well as award winning Boston actress, Paula Plum. Making his stage debut, the show also featured radiation oncologist extraordinaire, Dr. Joe Barthold of the Beth Israel Deaconess Hospital. To learn more about empowerHER and the wonderful work they do to empower young girls who have experienced the early loss of their mother, visit www.empoweringher.org. The Learn, Live, Love Cancer Outreach Organization, a local nonprofit that provides financial assistance to women and families who have been touched by cancer, benefited from a staged reading of the new comedy - The MOMologues: Pink Ribbon Overdose at the Company Theatre in Norwell, MA on February 9, 2011. Back by popular demand after a triumphant, sold-out performance at the Hard Rock Cafe in Boston on October 27, 2010, the cast again starred WCVB-TV5's newswomen Bianca de la Garza, Susan Wornick, and Karen Holmes Ward, film and television actress Erica McDermott (The Fighter) and Ellie Fund Executive Director Julie Nations in the production that mines the experience of breast cancer for laughs. All the cast members have been touched by breast cancer through the experiences of family members and other loved ones.